Win cash prizes and airtime with our interactive skill based games and general knowledge quizzes. offers subscribers the chance to win amazing cash prizes and airtime daily. The subscribers number must match the winning number sequentially. The closer the match, the greater the prize. A skill-based mobile game that requires players to rearrange gems vertically and horizontally in order to clear the board and move to the next level. Subscribers win monthly prizes and a grand prize at the end of every tournament period. 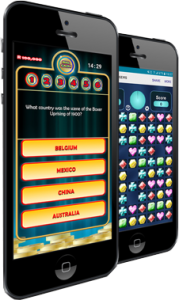 A mobile game that tests the subscriber’s general knowledge and offers cash prizes for reaching higher levels.